Please note that this post is based on what we've experienced - it's our personal opinion and it's written from our own perspective. Check HandZaround Disclaimer for more details, if you have any doubts. 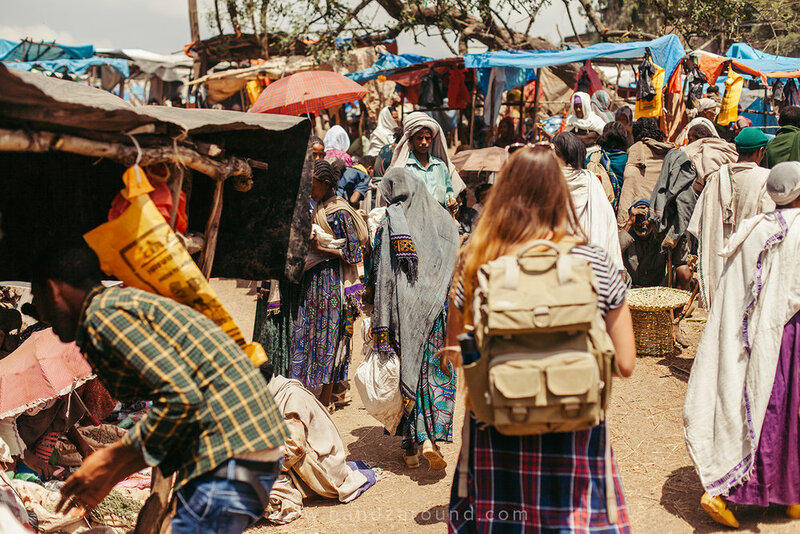 You may have read our ‘Should we be scared of going to Ethiopia?’ post, which we wrote a few months ago, before our journey to Ethiopia and just after we arrived. We won’t lie - we were pretty stressed about going to Ethiopia… our parents were so worried about our safety, everyone was asking us whether we’re scared, and on top of that, the government advice warned us against going to the areas of Ethiopia that we were planning on going (they were marked on the Ethiopian map as ‘red’, meaning ‘Advising against all travel’). Fast forward a few months - we are now in Kenya, after spending three months in Ethiopia, travelling all around the North and crossing the border in the South of the country, from Addis Ababa to Nairobi. And we went to the areas that were marked as ‘red’ on the UK government website. Saying that - we don’t advise you not to follow UK’s government travel advice - we understand that they need to secure themselves because people may sue them, if something bad happened to them. But what’s the reality then? How safe is it to travel in Ethiopia? Is it safe to travel as a single person, as a solo girl or guy, or as a family with kids? Do you need to travel around Ethiopia in a group to be safe? And, is it safe for the kids to travel in Ethiopia? We’ll try and answer all these questions based on what we’ve experienced, so stay with us! Obviously we’re not a single girl, so we can’t speak for them, but Hanna indeed is a girl (yay!). And on our travels through Ethiopia we met a lot of girls traveling alone. They took buses, they walked around Ethiopian towns in the evening, and you know - all these other situations considered generally to be ‘vulnerable’. We moticed that local men will be interested in you, especially if you’re a white girl, and they will want to chat to you, which may be a bit tiring after a while, but lots of them will call you ‘sister’, rather than treating you in a sexual way. A good thing to consider whilst travelling as a single girl (we don’t mean the relationship status, but travelling alone) is wearing clothes that would help you merge in the crowd a bit. Ethiopian women in Addis Ababa wear all sorts of things - from high end catwalk garments to traditional Ethiopian dress. In majority though, they don’t wear skimpy shorts and crop tops that you’d see at the beach in LA. When it comes to travelling outside of Addis, you may want to wear a skirt covering your knees, or trousers. Or if you wear short denim shorts, maybe you can throw a long kimono on yourself to cover your legs a bit? It’s not necessary, but locals will appreciate it, and it may help in avoiding stares or catcalling. Read more about being harassed, public transport safety and travelling independently, below. Same goes here - we can’t really talk from experience as we travelled as a couple, but this part is for Zach - he’s a guy! We met a lot of guys travelling alone and they had as much fun as everyone else. Same as travelling as a girl, we can say that fellow-single-guy-travellers, who we met, also took buses, walked around Ethiopian towns in the evening, and did a lot of other things that were fun - like having a beer with local Ethiopians, who had invited them in. Of course as a guy you don’t really experience any catcalling from men (self-explanatory) but from what we observed you may be seen as ‘a walking wallet’ a bit more often - maybe it’s just us but that’s what we felt. In terms of interactions with Ethiopian women - in majority they were really shy towards Zach and didn’t want to really interact with him, besides a shy smile. …FOR A COUPLE OR GROUP OF FRIENDS? Fun! If you’re travelling to Ethiopia as a couple, or a group of friends, you will also be totally fine. Again, we met countless couples travelling around Ethiopia and a few big groups of friends. It makes stuff cheaper and you always feel a bit more secure, if someone gives you weird looks. As a couple we noticed that Ethiopians would rather speak to Zach, than Hanna. If there was business to be had - bargaining something, discussing taxi price or asking to give them money - Zach would be the first person they would turn to. Which makes it annoying to think that Hanna can’t deal with these things, but also nice that she actually doesn’t have to deal with this stuff (easy!). …FOR A FAMILY WITH SMALL KIDS? Totally fine - we didn’t meet as many families with small kids as single travellers or couples, but we did meet or see a few of them. They obviously had to be a bit more organised which sometimes might have been challenging with things being late or not well-organised (not through their fault), but safety-wise it was all fine for them. And Ethiopians loved chatting to their kids! Pretty much all we wrote in the previous paragraphs would apply here as well. DO TOURISTS GET HARASSED IN ETHIOPIA? So, as much as it is safe to travel around Ethiopia, you need to realise that sometimes not-so-nice situations may happen - as they can and do happen in any city in the world. Just be ready for them, so you’re not disappointed. Some people are very desperate for money and they will try to get it from you by all means. Since we absolutely never ever give money to anyone, unless they earned it in some way, we often came across people who were not happy about it and were manifesting it in different ways. Let us tell you about couple of situations that we would rather not talk about, but we feel they’re important to mention so you can avoid them. Once we were walking down the street in Addis at night and two young boys came up to us begging for money. From experience we knew that ignoring them was unfortunately the best way to go - we learnt that if you get yourself into a discussion, nothing good comes out of it. So as we were walking past them and ignoring them, they were absolutely not happy about it and decided to pull Zach’s arm, which came across rather aggressively. After we gave them a clear loud reprimand about not doing that, they eventually left us, but it wasn’t the nicest situation. Another thing we realised was that if you walk down the street looking confident, as if you knew where you're heading to, people will more likely leave you alone, whereas if you walk hesitantly and you stop from time to time, they will come near you, and they will usually want something from you. Then in Lalibela, we were also walking down the street when a group of kids ran up to us (about 10-15 kids) asking for money. We ignored them, but when they started calling us names, we loudly said ‘NO’ to let them know that we are not okay with it. Being all frustrated, the kids started to throw little rocks at us. Pretty horrible, but they are just kids, we thought. The worst thing was that the adults standing around didn’t do anything to stop them, so we just kept walking away, ignoring their behaviour - it’s not like they were throwing rocks at our heads or anything like that, it was just small rocks thrown in our direction. And last one - one evening in Addis Ababa, we decided to take a minibus, which we were doing very often and nothing bad had ever happened to us. This particular night, eventually all the passengers got off a couple of stops before our stop. We knew the route and the price exactly as we had taken the same minibus many times.. When we were nearing our stop, the driver openly expressed he wasn’t happy that he was driving just the two us to the bus stop - we weren’t feeling too safe listening to his tone of voice so we offered to get off earlier and catch a private taxi, but he kept driving, ignoring what we were saying. He started talking about us being ‘farangis’, which in his understanding meant we have to pay more and also he told us he now suddenly turned into a private taxi because there were only two of us in the minibus (although it was the route he always takes whether there are people in his minibus or not). Eventually he requested us to pay 10 times the actual price, to which we denied, saying we know how much it costs and he can’t just do it. We walked away, paying eventually 3 times more as otherwise he wouldn’t let us go, but he screamed offensive words in our direction. It wasn’t a lot of money of course, but we didn't want people like him thinking that because we are ‘farangis’, he can do this to us. All in all, just be prepared. These things may happen to you, and don’t let things like that fool you into giving money to people. Giving money to people on the street is not a long term solution and it does more harm than you think. Just deal with situations like that, and move on. Nobody will actually hurt you, they will just show that they’re not happy about you or the situation. Before we came to Ethiopia, we were absolutely dreading taking local buses as we had read somewhere that Ethiopia has the highest number of deaths caused by road accidents. But we did it anyways, and thank goodness, because we would have missed out on all these beautiful views we saw on the way (and all the loud Ethiopian music played on the buses that made our ears explode!). The buses we took around the North of Ethiopia were awesome. 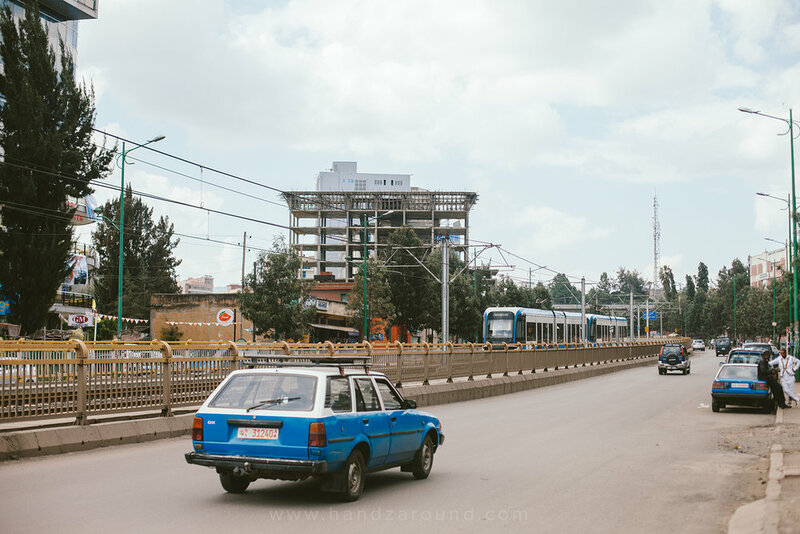 Selam Bus, Abay Bus, Sky Bus - these are the companies that locals use to get around Ethiopia. The buses are relatively new, big, have seat belts and the seats are pretty comfy. Sometimes things are broken, like the table on the back of the seat in front of you, or the armrest, but the buses are generally in good repair. These buses are not overcrowded and your luggage is stored away safely with a luggage tag underneath the bus. The tickets are relatively cheap. It’s totally safe to take these buses - if some road is closed due to some local protests, the bus won’t go that way. The driver doesn’t want to risk his wellbeing, so why would he go that way? 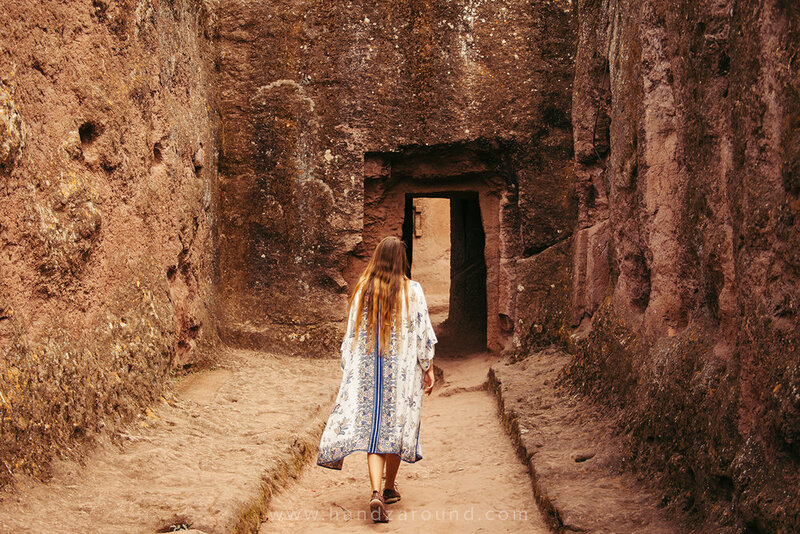 A lot of roads that we took in the North were in good condition, although a couple of roads (the last two hours to Lalibela, or the road to Blue Nile Falls from Bahir Dar, as well as a big chunk of the roads in the South) were dirt-roads in pretty poor condition. The buses or minibuses that go on these dirt roads are not managed by any official company mentioned above. These are 'the real local' buses where indeed your luggage will go on the roof and they will be very overcrowded and falling apar. Nonetheless, we always felt pretty safe. The old buses on the dirt roads wouldn’t go fast because of their condition and the condition of the roads, so we were never worried as the driver was never going too fast or anything like that. They were just super uncomfortable, but bearable. Yes! That’s what we did! 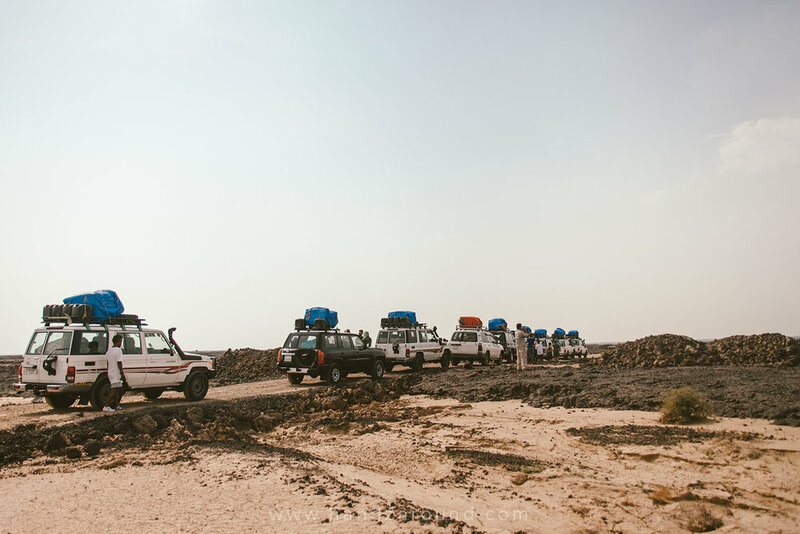 The only time we had to use a tour company was when we went to the Danakil Depression in Afar Region. This region is not politically stable and it’s close to the border with Eritrea, which means there are some clashes between the two countries. In Afar we travelled in a convoy and with local police. All was good - we weren’t feeling unsafe at any time. The rest of Ethiopia was fine. Couple of times we were worried because we were passing through cities that we heard had local protests, but again - we didn’t see anything alarming, we weren’t feeling unsafe and nothing happened to us. We were always asking many locals the same questions and comparing the answers. We would ask ‘is it safe to go through Sheshamane?’ - because we heard there were protests there. They would then go on why it is safe or why it isn’t safe, and we would then make up our mind. The UK government advice says to absolutely stay away from the border crossing of Ethiopia and Kenya. But after talking to a lot of locals on what they think of our idea, and hearing that it’s fine and safe, we decided to take that route. And we were totally fine - no problems whatsoever. It was actually the easiest overland crossing we have crossed through. But again, we don’t want you to think that because we didn’t have any problems, you won’t have them. We may have just gotten a 'good' day at the border. All in all, we were absolutely fine travelling independently around Ethiopia, even though at times we felt uneasy when in small towns or villages when people didn’t really smile back. But we believe that we left a positive image stuck in their mind with our smiles, so maybe next time they see a ‘faring’ they’ll smile back! And most importantly we can’t believe that initially we were even slightly scared of coming to Ethiopia - we feel like laughing at ourselves now! Because you know... we’re still alive, we’re all fine, and most of all we’re super happy about all the beautiful things we’ve seen and amazing adventures that we’ve experienced!